Official description Look out! A rainbow of Kirbys is after you! Kirbys on Parade (夢の泉の物語, Story of the Fountain of Dreams) is the 6th event match of the 51 event matches in Super Smash Bros. Melee. 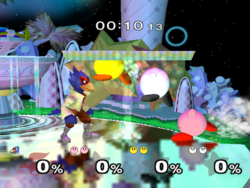 As an available character of their choice, the player must win a stock match against a team of three tiny CPU Kirbys. This match takes place on Fountain of Dreams and has no time limit. The player starts with 1 stock, while each Kirby starts with 2 stocks. Being tiny, the CPU Kirbys are light, weak, and tend to avoid the player and use Final Cutter from afar. However, if the player's character comes to close to the Kirbys, they will attack erratically. This is because each of the Kirbys uses the FREAK CPU mode. The Japanese name of this event is the same as the Japanese name for Kirby's Adventure. This page was last edited on February 8, 2019, at 21:11.